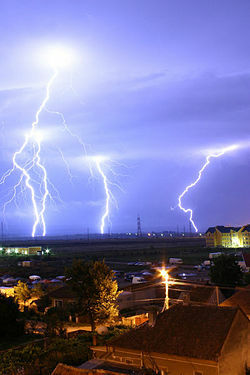 Lightning over Oradea in Romania. Lightning is an atmospheric discharge of electricity, which typically occurs during thunderstorms, and sometimes during volcanic eruptions or dust storms. Thus was the frustration of learned men in his time of the desire to know the true nature of lightning and other such common phenomena. However, in the Western world the true nature and understanding behind its force would become known by the eighteenth century. Benjamin Franklin (1706-1790) endeavored to test the theory that sparks shared some similarity with lightning using a spire which was being erected in Philadelphia. While waiting for completion of the spire, he got the idea of using a flying object, such as a kite, instead. During the next thunderstorm, which occurred in June 1752, it was reported that he raised a kite, accompanied by his son as an assistant. On his end of the string he attached a key and tied it to a post with a silk thread. As time passed, Franklin noticed the loose fibres on the string stretching out; he then brought his hand close to the key and a spark jumped the gap. The rain which had fallen during the storm had soaked the line and made it conductive. Franklin was not the first to perform the kite experiment. Thomas-François Dalibard and De Lors conducted it at Marly-la-Ville  in France a few weeks before Franklin's experiment. In his autobiography (written 1771-1788, first published 1790), Franklin clearly states that he performed this experiment after those in France, which occurred weeks before his own experiment, without his prior knowledge as of 1752. According to author Tom Tucker, Franklin never actually performed the famed kite experiment, but rather published his account of it as a hoax, possibly to endanger his detractors. World map showing frequency of lightning strikes, in flashes per km² per year. Lightning strikes most frequently in the Democratic Republic of the Congo. A bolt of lightning can travel at a speed of 45 km/s (kilometers per second) (100,000 mph, 160,000 km/h). It can reach temperatures approaching 28,000 °C (50,000 °F), hot enough to fuse soil or sand into glass channels. An average bolt of negative lightning carries an electric current of 40 kA (kiloamperes), although some bolts can be up to 120 kA, and transfers a charge of 5 coulombs and 500 MJ (megajoules), or enough energy to power a 100 watt lightbulb for just under two months. The voltage depends on the length of the bolt: with the dielectric breakdown of air being 3 million volts per meter, this works out at about one billion volts for a 300m (1,000 feet) lightning bolt. Different locations have different potentials (voltages) and currents for an average lightning strike. For example, Florida, with the United States' largest number of recorded strikes in a given period during the summer season, has very sandy ground in some areas and conductive saturated mucky soil in others. As much of Florida lies on a peninsula, there is a daily development of sea and lake breeze boundaries that collide and produce thunderstorms. Arizona, which has very dry, sandy soil and very dry air, has cloud bases as high as 6,000-7,000 feet above ground level, and gets very long and thin purplish discharges that crackle. Oklahoma, with cloud bases about 1,500-2,000 feet above ground level and fairly soft, clay-rich soil, has big, blue-white explosive lightning strikes that are very hot (high current) and cause sudden, explosive noise when the discharge comes. The difference in each case may consist of differences in voltage levels between the clouds and the ground. The first process in the generation of lightning is still a matter of debate. Scientists have studied root causes ranging from atmospheric perturbations (wind, humidity, and atmospheric pressure), to the impact of solar wind and accumulation of charged solar particles. Large quantities of ice in the clouds are suspected to enhance lightning development. This charge will neutralize itself through any available path. This may assist in the forcible separation of positive and negative charge carriers within a cloud or air, and thus help in the formation of lightning. Note: Positive lightning, a rarer form of lightning that originates from positively charged regions of the thundercloud, does not generally fit the pattern discussed below. Falling droplets of ice and rain become electrically polarized as they fall through the atmosphere's natural electric field. Another theory is that opposite charges are driven apart by the above mechanism and energy is stored in the electric field between them. Cloud electrification appears to require strong updrafts, which carry water droplets upward, supercooling them to -10 to -20 °C. These collide with ice crystals to form a soft, ice-water mixture called graupel. The collisions result in a slight positive charge being transferred to ice crystals, and a slight negative charge to the graupel. Updrafts drive lighter ice crystals upwards, causing the cloud top to accumulate increasing positive charge. The heavier negatively charged graupel falls towards the middle and lower portions of the cloud, building up an increasing negative charge. Charge separation and accumulation continue until the electrical potential becomes sufficient to initiate lightning discharges, which occurs when the gathering of positive and negative charges forms a sufficiently strong electric field. Lightning sequence. Duration: 0.32 seconds. An initial bipolar discharge, or path of ionized air, starts from a negatively charged mixed water and ice region in the thundercloud. The discharge ionized channels are called leaders. The negative charged leaders, called a "stepped leader," proceed generally downward in a number of quick jumps, each up to 50 meters long. Along the way, the stepped leader may branch into a number of paths as it continues to descend. The progression of stepped leaders takes a comparatively long time (hundreds of milliseconds) to approach the ground. This initial phase involves a relatively small electric current (tens or hundreds of amperes), and the leader is almost invisible compared to the subsequent lightning channel. Lightning illuminates the night sky. CGRO recorded only about 77 events in ten years, however more recently, the RHESSI spacecraft, as reported by David Smith of UC Santa Cruz, has been observing TGFs at a much higher rate, indicating that these occur ~50 times per day globally (still a very small fraction of the total lightning on the planet). The energy levels recorded exceed 20 MeV. Early theories of this pointed to lightning generating high electric fields at altitudes well above the cloud, where the thin atmosphere allows gamma rays to easily escape into space, known as "relativistic runaway breakdown," similar to the way sprites are generated. Subsequent evidence has cast doubt, though, and suggested instead that TGFs may be produced at the tops of high thunderclouds. Though hindered by atmospheric absorption of the escaping gamma rays, these theories do not require the exceptionally high electric fields that high altitude theories of TGF generation rely on. 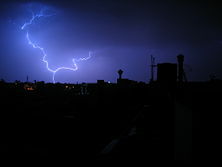 High speed videos (examined frame-by frame) show that most lightning strikes are made up of multiple individual strokes. A typical strike is made of 3 to 4 strokes, but there can be more. Each re-strike is typically separated by about 40 to 50 milliseconds. Re-strikes can cause a noticeable "strobe light" effect. The sound of thunder from a lightning strike is prolonged by successive strokes. Some lightning strikes take on particular characteristics. Scientists and the public have given special names to these various types of lightning. Most lightning is "streak lightning." It is nothing more than the return stroke, the visible part of the lightning stroke. Because most of these strokes occur inside a cloud, we do not see many of the individual return strokes in a thunderstorm. Lightning discharges may occur between areas of cloud having different potentials without contacting the ground. These are most common between the anvil and lower reaches of a given thunderstorm. This lightning can sometimes be observed at great distances at night as so-called "heat lightning." In such instances, the observer may see only a flash of light without thunder. The "heat" portion of the term is a folk association between locally-experienced warmth and the distant lightning flashes. 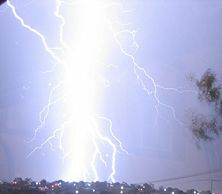 Fork Lightning, Tamworth, New South Wales, Australia. Rocket lightning is a form of cloud discharge, generally horizontal and at cloud base, with a luminous channel appearing to advance through the air with visually resolvable speed, often intermittently. The movement resembles that of a rocket, hence its name. It is also one of the rarest of cloud discharges. Positive lightning, also known colloquially as a "bolt from the blue," makes up less than 5 percent of all lightning. It occurs when the leader forms at the positively charged cloud tops, with the consequence that a negatively charged streamer issues from the ground. The overall effect is a discharge of positive charges to the ground. 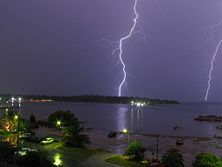 Research carried out after the discovery of positive lightning in the 1970s showed that positive lightning bolts are typically six to ten times more powerful than negative bolts, last around ten times longer, and can strike tens of kilometers/miles from the clouds. The voltage difference for positive lightning must be considerably higher, due to the tens of thousands of additional metres/feet the strike must travel. During a positive lightning strike, huge quantities of ELF and VLF radio waves are generated. As a result of their greater power, positive lightning strikes are considerably more dangerous. At the present time, aircraft are not designed to withstand such strikes, since their existence was unknown at the time standards were set, and the dangers unappreciated until the destruction of a glider in 1999. Positive lightning is also now believed to have been responsible for the 1963 in-flight explosion and subsequent crash of Pan Am Flight 214, a Boeing 707. 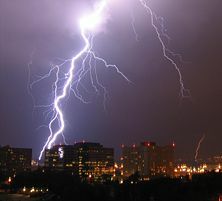 Subsequently, aircraft operating in U.S. airspace have been required to have lightning discharge wicks to reduce the chances of a similar occurrence. One special type of cloud-to-ground lightning is anvil-to-ground lightning. It is a form of positive lightning, since it emanates from the anvil top of a cumulonimbus cloud where the ice crystals are positively charged. The leader stroke issues forth in a nearly horizontal direction until it veers toward the ground. These usually occur miles from (often ahead) of the main storm and will sometimes strike without warning on a sunny day. An anvil-to-ground lightning bolt is a sign of an approaching storm, and if one occurs in a largely clear sky, it is known colloquially as a "Bolt from the blue". This is probably cloud-to-ground lightning, but it is difficult to distinguish from ground-to-cloud by visual inspection. Ball lightning is described as a floating, illuminated ball that occurs during thunderstorms. They can be fast moving, slow moving, or nearly stationary. Some make hissing or crackling noises or no noise at all. Some have been known to pass through windows and even dissipate with a bang. Ball lightning has been described by eyewitnesses but rarely recorded by meteorologists. Several theories have been advanced to describe ball lightning, with none being universally accepted. Any complete theory of ball lightning must be able to describe the wide range of reported properties, such as those described in Singer's book The Nature of Ball Lightning and also more contemporary research. 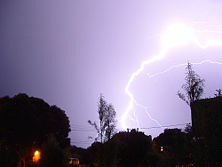 Japanese research shows that ball lightning has been seen several times without any connection to stormy weather or lightning. Ball lightning is typically 20 – 30 cm (8-12 inches) in diameter, but ball lightning several meters in diameter has been reported. Ball lightning has been seen in tornadoes, and it has been seen to split apart into two or more separate balls and recombine. Also, vertically linked fireballs have been reported. Because of its strange behavior, ball lightning has been mistaken for a UFO by many witnesses. One theory that may account for this wider spectrum of observational evidence is the idea of combustion inside the low-velocity region of axisymmetric (spherical) vortex breakdown of a natural vortex. Sprites may be horizontally displaced by up to 50 km (30 miles) from the location of the underlying lightning strike, with a time delay following the lightning that is typically a few milliseconds, but on rare occasions may be up to 100 milliseconds. Sprites are sometimes, but not always, preceded by a sprite halo, a broad, pancake-like region of transient optical emission centered at an altitude of about 75 km above lightning. Sprite halos are produced by weak ionization from transient electric fields of the same type that causes sprites, but which are insufficiently intense to exceed the threshold needed for sprites. Sprites were first photographed on July 6, 1989, by scientists from the University of Minnesota and named after the mischievous sprite (air spirit) Ariel in Shakespeare's "The Tempest." Blue jets differ from sprites in that they project from the top of the cumulonimbus above a thunderstorm, typically in a narrow cone, to the lowest levels of the ionosphere 40 to 50 km (25 to 30 miles) above the earth. They are also brighter than sprites and, as implied by their name, are blue in color. They were first recorded on October 21, 1989, on a video taken from the Space Shuttle as it passed over Australia. They were subsequently extensively documented in 1994 during aircraft research flights by the University of Alaska. On September 14, 2001, scientists at the Arecibo Observatory photographed a huge jet double the height of those previously observed, reaching around 80 km (50 miles) into the atmosphere. The jet was located above a thunderstorm over the ocean, and lasted under a second. Lightning was initially observed traveling up at around 50,000 m/s in a similar way to a typical blue jet, but then divided in two and sped at 250,000 m/s to the ionosphere, where they spread out in a bright burst of light. On 22 July 2002, five gigantic jets between 60 and 70 km (35 to 45 miles) in length were observed over the South China Sea from Taiwan, reported in Nature. The jets lasted under a second, with shapes likened by the researchers to giant trees and carrots. Lightning has been triggered directly by human activity in several instances. Lightning struck the Apollo 12 soon after takeoff, and has struck soon after thermonuclear explosions . It has also been triggered by launching lightning rockets carrying spools of wire into thunderstorms. The wire unwinds as the rocket climbs, making a convenient path for the lightning to use. These bolts are typically very straight, due to the path created by the wire. Extremely large volcanic eruptions, which eject gases and solid material high into the atmosphere, can trigger lightning. This phenomenon was documented by Pliny The Elder during the 79 C.E. eruption of Mount Vesuvius, in which he perished. Volcanic material thrust high into the atmosphere can trigger spectacular lightning. Lightning requires the electrical breakdown of a gas, so it cannot exist in a visual form in the vacuum of space. 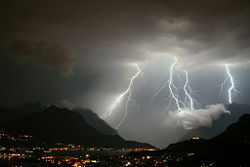 However, lightning-like phenomena have been observed within the atmospheres of other planets, such as Venus and Jupiter. Lightning on Venus is still a controversial subject after decades of study. The Soviet Venera and U.S. Pioneer missions of the 1970s and 1980s sent signals suggesting lightning in the upper atmosphere of Venus. More recently, however, the Cassini-Huygens mission fly-by of Venus detected no signs of lightning at all. Lightning damage to tree in Maplewood, New Jersey. One type of tree that is frequently struck is the pine. Unlike the oak, which has a relatively shallow root structure, the pine has a deep central root that goes down into the water table. The pine usually stands taller than other species, which also makes it a likely target. In Johannesburg—one place with a very high incidence of lightning strikes—the most commonly struck tree is Cedrus deodara, locally known as the Christmas tree. Factors which lead to its being targeted are a high resin content, its loftiness and its needles which lend themselves to a high electrical discharge during a thunderstorm. Lightning currents are characterized by a high rate of change, on the order of 40 kA per microsecond. Hence, conductors of such currents exhibit marked skin effect, causing most of the currents to flow through the conductor skin. The effective resistance of the conductor is consequently very high and therefore, the conductor skin gets heated up much more than the conductor core. When a tree acts as a natural lightning conductor, due to skin effect most of the lightning currents flow through the skin of the tree and the sap wood. As a result, the skin gets burnt and may even peel off. The moisture in the skin and the sap wood evaporates instantaneously and may get split. 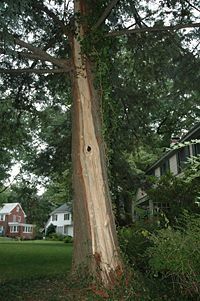 If the tree struck by lightning is a teak tree (single stemmed, with branches) it may not be completely destroyed, because only the tree skin and a branch may be affected; the major parts of the tree may be saved from complete destruction due to lightning currents. But if the tree involved is a coconut tree, it may be completely destroyed by the lightning currents. On average, lightning strikes the earth about 100 times every second. "Lightning Alley," referring to Interstate 4 between Orlando and St. Petersburg, Florida, collectively sees more lightning strikes per year than any other place in the United States. Lightning Alley averages 120 thunderstorm days per year. The Empire State Building is struck by lightning on average 23 times each year, and was once struck 8 times in 24 minutes. In July 2007, lightning killed up to 30 people when it struck a remote mountain village Ushari Dara in northwestern Pakistan. Also, in Deerfield Beach, Florida lightning struck a diver's air tank as he surfaced off Florida's Atlantic coast, killing him. He had surfaced about 30 feet from the boat when lightning struck his tank. In French and Italian, the expression for "love at first sight" is coup de foudre and colpo di fulmine, respectively, which literally translated mean "bolt of lightning." Some European languages have a separate word for lightning that strikes the ground, as opposed to lightning in general—often it is a cognate of the English word "rays." The bolt of lightning in heraldry is called a thunderbolt and is shown as a zigzag with non-pointed ends. It is distinguished from the "fork of lightning." Harry Potter, protagonist in the Harry Potter series of books authored by J.K. Rowling, has a lightning-bolt shaped scar on his forehead. The scar was a result of a failed killing curse, which resulted in the downfall of Lord Voldemort. The scar plays an important role in the series. ↑ 1.0 1.1 1.2 Joseph Needham. 1986. Science and Civilisation in China, Volume 3: Mathematics and the Sciences of the Heavens and the Earth. (Taipei: Caves Books Ltd. ISBN 0521058015). ↑ E. Philip Krider, 2004. Benjamin Franklin and the First Lightning Conductors. Proceedings of International Commission on History of Meteorology 1(1):1-13. ↑ Tom Tucker. 2003. Bolt of Fate: Benjamin Franklin and His Electric Kite Hoax. (New York, NY: Public Affairs. ISBN 1586482947). 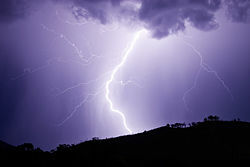 ↑ Lightning Can Kill Before Storm Strikes.Kansas State Research and News. 2003. Retrieved August 23, 2007. ↑ How Hot Is Lightning? Retrieved August 23, 2007. ↑ Flashes in the Sky: Lightning Zaps Space Radiation Surrounding Earth. Retrieved August 23, 2007. ↑ Robert Roy Britt, 1999. Lightning Interacts with Space, Electrons Rain Down. Retrieved August 23, 2007. ↑ How Lightning Forms. PBS.org. Retrieved August 23, 2007. ↑ 11.0 11.1 Lightning Science. NOAA. Retrieved August 23, 2007. ↑ USGS, Hawaii Observation. Account of ash lightning. See 5th paragraph. Retrieved August 23, 2007. ↑ Teachers Guide to Stratovolcanoes of the World, Galgunggung, Indonesia. Retrieved August 23, 2007. ↑ Electric Ice. NASA. Retrieved August 23, 2007. ↑ Alicia Frazier, 2005. THEORIES OF LIGHTNING FORMATION. Department of Atmospheric and Oceanic Sciences, University of Colorado, Boulder. Retrieved August 23, 2007. ↑ Gurevich. 2003. How Lightning Works Is Still A Mystery. The Economist. ↑ Joseph R. Dwyer, 2005. "A bolt out of the blue." Scientific American 292(5):64-71. ↑ Mark Shrope, 2004. Lightning research: The bolt catchers. Nature 431:120-121. Retrieved August 23, 2007. ↑ U.S. Inan, S.C. Reising, G.J. Fishman, and J.M. Horack. 1996. On the association of terrestrial gamma-ray bursts with lightning and implications for sprites. Geophysical Research Letters 23(9):1017-1020. As quoted by Red Sprites and Blue Jets. Retrieved August 23, 2007. ↑ 21.0 21.1 Uman, 1986, Chapter 5, 41. ↑ Definition of Rocket Lightning, AMS Glossary of Meteorology. Retrieved August 23, 2007. ↑ Beaded Lightning. American Meteorological Society (AMS). Retrieved August 23, 2007. ↑ Uman, 1986, Chapter 16, 139-143. ↑ The Positive and Negative Side of Lightning. NOAA. Retrieved August 23, 2007. ↑ D. J. Boccippio, et al. 1995. Sprites, ELF Transients, and Positive Ground Strokes. Science 269:1088-1091. ↑ Air Accidents Investigation Branch (AAIB) Bulletins 1999 December: Schleicher ASK 21 two seat glider. Retrieved August 23, 2007. ↑ A Lightning Primer from the GHCC: Types of Lightning Discharges. Retrieved August 23, 2007. ↑ David Lawrence, Bolt from the Blue. National Oceanic and Atmospheric Administration. Retrieved August 23, 2007. ↑ Nicola Tesla. 1904. Electrical World and Engineer. Retrieved August 23, 2007. ↑ Coleman was the first to propose this theory in 1993 in Weather, a publication of the Royal Meteorological Society. ↑ H. C. Stenbaek-Nielsen, M.G. McHarg, T. Kanmae, D.D. Sentman. 2007. "Observed emission rates in sprite streamer heads." Geophys. Res. Lett. 34:11. The abstract is publicly accessible. This paper is discussed on LiveScience. Retrieved August 23, 2007. ↑ VLF/ELF sferic evidence for in-cloud discharge activity producing sprites. Retrieved August 23, 2007. ↑ Letters to nature. Retrieved August 23, 2007. ↑ 1987. An empirical study of the nuclear explosion-induced lightning seen on IVY-MIKE. Journal of Geophysical Research 92:D5:5696-5712. Retrieved August 23, 2007. ↑ July 25, 2002, triggered lightning video. Retrieved August 23, 2007. ↑ Pliney the Younger. Pliny the Younger's Observations. "Behind us were frightening dark clouds, rent by lightning twisted and hurled, opening to reveal huge figures of flame." Retrieved August 23, 2007. ↑ 2001. UNM researchers use lasers to guide lightning. Campus News, The University of New Mexico. Retrieved August 23, 2007. ↑ Laser-triggered lightning discharge. New Journal of Physics. Retrieved August 23, 2007. ↑ Laboratory tests of laser-induced lightning discharge. Journal of Optical Technology. Retrieved August 23, 2007. ↑ Applied Physics Letters—December 6, 2004—Volume 85, Issue 23, pp. 5781-5783. Retrieved August 23, 2007. ↑ The electric field changes and UHF radiations caused by the lightning in Japan. Retrieved August 23, 2007. ↑ A laser-induced lightning concept experiment. Retrieved August 23, 2007. ↑ photo of a tree being struck by lightning. Retrieved August 23, 2007. ↑ A 120 years old tree exploded by lightning. Arobretum de Villardebelle. Retrieved August 23, 2007. ↑ Oak Root Research. Olympia Forestry Sciences Laboratory. Retrieved August 23, 2007. ↑ Gopalan. 2005. Lightning protection of airport runway. ASCE Jl of Performance of Constructed Facilities 19:4. ↑ Zinnia Nair, et al. May 1, 2005. Failure of 220 kV double circuit transmission line tower due to lightning. ASCE Jl of Performance of Constructed Facilities 19 (2). ↑ 50.0 50.1 Uman, 1986, chapter 6, 47. ↑ Lightning Activity in Singapore. National Environmental Agency. Retrieved August 23, 2007. ↑ SULLIVAN, Roy. The New York Times Archives (from UPI). Retrieved August 23, 2007. ↑ Lightning kills 30 people in Pakistan's north. Reuters. Retrieved August 23, 2007. ↑ Lightning Detection Systems. NOAA page on how the U.S. national lightning detection system operates. Retrieved August 23, 2007. ↑ Vaisala Thunderstorm Online Application Portal. Real-time map of lightning discharges in U.S. Retrieved August 23, 2007. ↑ Dataset Information LIS browse images OTD browse images. Retrieved August 23, 2007. ↑ Jesus actor struck by lightning.BBC News October 23, 2003. Retrieved August 23, 2007. Anders, André. 2003. Tracking Down the Origin of Arc Plasma Science I. Early Pulsed and Oscillating Discharges. IEEE Transactions on Plasma Science 31(4):1052-1059. Dwyer, Joseph R. 2005. A Bolt out of the Blue. Scientific American. Retrieved August 23, 2007. Giella, Thomas F. My Very Close Encounters With Florida Lightning Bolts. Retrieved August 23, 2007. Gosline, Anna. 1986. Thunderbolts from space. New Scientist 186(2498):30-34. Larsen, Alex. 1905. Photographing Lightning With a Moving Camera. Annual Report Smithsonian Institute 60(1):119-127. Rakov, V.A. and Martin A. Uman. 2003. Lightning, physics and effects. Cambridge, UK: Cambridge University Press. ISBN 0521583276. The Mirror of Literature, Amusement, and Instruction, Vol. 12, Issue 323, July 19, 1828 The Project Gutenberg eBook (early lightning research). Retrieved August 23, 2007. Krampf, Robert. 1991. Electricity. VHS Video. Memphis, TN: William Bearden Co. 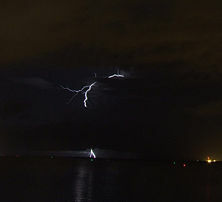 Positive lightning photography from Florida. Laser Beam Triggers Lightning Strike During Japanese Experiment. Webarchive: April 25, 1997 Sandia-led research may zap old beliefs about lightning protection at critical facilities; Triggered lightning tests leading to safer storage bunkers. 2003-11-06, ScienceDaily: Thunderstorm Research Shocks Conventional Theories; Florida Tech Physicist Throws Open Debate On Lightning's Cause. Oak tree exploded from lightning strike, by Igor Chudov. Austrian Lightning Detection and Information System. European Cooperation for Lightning Detection. How to Photograph Lightning A page with both brief and verbose instructions on taking lightning photos. NASA Finds Lightning Clears Safe Zone in Earth's Radiation Belt. Live storm data and sferics for southern England generated by data recorded by a weather station at Newport, Isle of Wight, UK. Homepage of the Eurosprite campaign, itself part of the CAL (Coupled Atmospheric Layers) research group. eurosprite.net. Ground and Balloon-Borne Observations of Sprites and Jets. Quote: "…Red sprites and blue jets are brief but powerful lightning-like flashes that appear at altitudes of 40-100 km (25-60 miles) above thunderstorms…." Darwin Sprites '97. Space Physics Group, University of Otago.